Not sure why we got to this subject towards the end of my recent podcast with Head Coach Kevin Conry from Michigan, but I learned a lot. Let me begin by suggesting I enjoy an outside reputation as a pretty good, but in my eyes not great coach. Or perhaps 35-40 yrs counts for something. 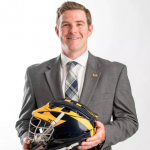 However there are lacrosse-coaching areas that I am not so good at all, coaching goalies, coaching the minutia of face offs, … and Team Leadership within the Team. Actually I am terrible. I think I have modified my coaching style to address the unique characteristics of Millennial players, even spoken at LaxCon on that very subject. And as some of you know I have written books on the subject in my Leadership Consulting work at the corporate level, so I have 20 years of research. But I yearn for better leadership with this generation on my lacrosse teams, at least in my experience, not speaking for anybody else. Young players today are not going to automatically respect authority figures simply because they have the title of Coach or regardless of how many Coach of the Year Awards you might have. More so than with any previous generation of players respect needs to be earned by coaches everyday with the practice plan, the preparation by the coach, as well as the communication style, but that is another article.